Monograph Publishing: “The Grand Adventures of Petit Louis” by Kayce M. Swigelson is a children’s book about a vain little black and white cat who travels the streets of Paris searching for the perfect birthday gift for his owner, Claire. 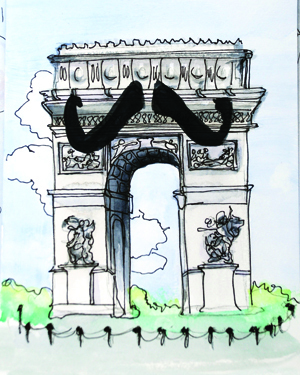 Petit Louis, a handsome tuxedo cat, considers anything without a mustache to be inferior, so as he roams the streets looking for Claire’s present, he stops along the way to make the landmarks of Paris more beautiful by painting mustaches on them. 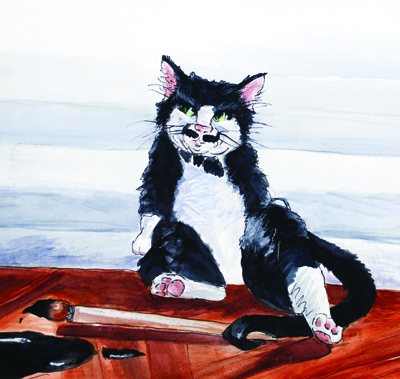 Petit Louis, a handsome, tuxedo cat, considers anything without a mustache to be inferior. “The Grand Adventures of Petit Louis” is a well-written, delightfully-illustrated, 8 1/2 x 11, 40-page hard cover book that is educational as well as charming. 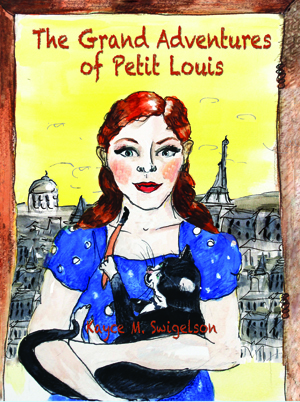 Swigelson, who wrote and illustrated the book, loves France and throughout the book she notes historical information about several of the landmarks that Petit Louis visits on his way to buy Claire a birthday gift. The Arc de Triomphe, the Eiffel Tower, and the Louvre are just a few of the places that the artistic cat beautifies as he agonizes over finding the perfect present for his owner. 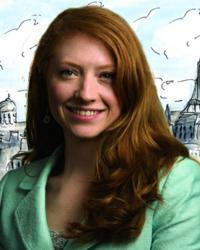 Swigelson, who studied French and spent a year in France, incorporates the French language with the English language as she identifies different objects in Louis’ travels around the city. She points out “fleurs” (flowers), tableaux (paintings), amis (friends), poisson (fish) and many other French words and highlights them in red so the reader can identify them with the corresponding English words. As Louis travels the streets of Paris, Swigelson educates readers with a brief history of each landmark that he passes along the way. Geared for children from 6 to 12, “The Grand Adventures of Petit Louis” is educational and entertaining. Readers are gently exposed to French culture as Louis rides the metro, visits cafes, climbs national monuments, meets interesting people and visits quaint shops and stores on his journey. Children and parents will enjoy the adventures of this mischievous cat as they learn together about the history, language and culture of France. During her junior year at Truman State University in northeastern Missouri, she had the opportunity to study French abroad in Angers, France. She lived in a three-story home with a couple in their sixties who, Swigelson notes, adopted her in every way. Determined to get her PhD, she was accepted as the only candidate in the M.A. program in French and Francophone studies at the University of Notre Dame in 2007 where she received full tuition. MA students at Notre Dame are required to teach a French language course, and although Swigelson accepted this as part of a hurdle to become a professor, she fell in love with teaching and taught every term at Notre Dame. Swigelson was recognized as the outstanding graduate instructor in French by the Kaneb Center for Teaching and Learning and was an inaugural fellow of the Nanovic Institute for European Studies Graduate Fellowship in Romance Languages. She currently lives in St. Louis and teaches French and art at Priory School, an exclusive, private boys school in St. Louis. “The Grand Adventures of Petit Louis” is available on Amazon and at MonographPublishing.com for $15.95. Monograph Publishing is a multi-dimensional company based in St. Louis, Missouri specializing in high quality publications, design, fine art prints and photography.